The most elegant shot in tennis—but should you learn it? There is no more beautiful, elegant shot than the one-handed backhand. When executed correctly, it is graceful, flowing, and aesthetically pleasing. But one of the most interesting debates in tennis is whether the double-hander or single-hander is "better". And which should be taught to whom when. My belief is that the answer depends on many factors. The two-handed backhand has become extremely popular and is taught almost universally to beginning players, at least in the US. This is because it gives the player early success. I believe the two-hander is unfortunately over taught in this country. American coaches are obsessed with early success. Our culture values quick results and lacks long-term vision, and no doubt the two-hander will make a young player hit better sooner. So how can that be bad? In the long run, the player may be better off with a single-handed shot, for individual tactical, psychological or physiological reasons. I believe coaches should experiment with their players to see if they have the aptitude, desire, strength, and coordination to learn a single-handed backhand. Certain athletes are more right arm dominant and will be better off with a one-hander, while other kids are able to generate a lot of racquet speed using the left side of the body and can synchronize both arms efficiently. A young player needs aptitude, desire and strength to hit with one hand. Too often I have seen players who, when given the chance to experiment, have very natural one-handed backhands, but they have been pigeonholed by the coaching mentality in the US that encourages all kids to learn with two hands first. I believe the same principle applies in adult coaching, especially with beginning men’s players, although some women also show a natural propensity for one-handers. All these players would be better off learning a one-handed shot from the very beginning. That being said, many players, maybe even most players, are probably better off with the two-hander and can successfully learn this shot and take it to the highest level of tennis. Coaches need to discover what type of athlete they are working with. They need to understand the benefits and weaknesses of the one-handed and two-handed shots. They need to build the backhand based on future game style and athletic aptitude, strength and coordination—and even more fundamentally--what the player desires to learn. Both the double-handed and single-handed shot can be successful at all levels, up to and including world-class. But juniors typically do not see many if any one-handers at local tournaments. The two-hander: compact swing, power, disguise, early success. This leads to the assumption that the two-hander is better. The truth is they are both great shots that have their own respective advantages and disadvantages. So let’s examine what they are. The strength and power that can be generated from a compact swing make the double-hander a great asset for both the attacking baseline player who likes to take the ball on the rise, or the more defensive player who has to hit a lot of passing shots. The double-hander uses the back and front shoulder together to hit the shot, and this allows later contact in emergencies. The two-hander can also hold shots longer than a one-hander and hit last minute angles with great disguise. Because of the extra support and strength, and the compact nature of the shot, the two-hander is great for players who rely on their return of serve as a weapon. It is easier for double-handed players to take the return early than for one-handed players and they can generate more power from a smaller swing. Especially at higher levels in the modern came the two hander has an advantage with high bouncing balls, both on serves and off the ground. A two hander can be an advantage for players who rely on their returns. These are the main advantages: power from a compact swing, stability, disguise, control late in the hitting zone, return of serve advantages, ability to deal with high bouncing heavy spin. In addition, two-handers also put less physical stress on the musculature of the right arm, reducing possible injury, and they tend to utilize the open stance more effectively than the one-handed player. As a general rule, I want players who will hit a lot of passing shots and rely on the return of serve to learn a double-handed backhand—but I always take into account the psychological and physical characteristics of the player. Sometimes a player may have this style of play, but be very right arm dominant, and this type of player will be better off with a one-hander. Or a player may simply have always wanted a flowing one-handed shot—and a coach has to respect that desire. (Robert Lansdorp makes the same point, Click Here.) But generally, I believe what is more natural for a kid biomechanically takes the developmental priority over future game style concerns or personal desire. The two handed can have reduced reach especially when hit with bent hitting arm configurations. But this is mitigated by the ability to hit latter with a shorter swing and by teaching the player a great one-handed slice when stretched. The slice: a critical mitigation for the two handed game. Players who develop two handers from the beginning reduce the development of strength and coordination in the right arm. This hurts the player’s backhand volley strength and agility. This can be mitigated with extensive compensation training on the backhand volley. Two-handers generally do not transition to the net as quickly or as often as one-handers. This is, however, more likely just a coaching failure rather than a technical limitation. I have two-handers who transition and play the all-court game just as well as my one-handed players. The key is teaching double-handers to be aggressive moving forward and who transition with the proper foot skills. Because the reach reduction is minimal at best with a two-hander, this is not really a determining factor in the decision to develop a one-hander or two-hander. I have heard of some coaches and parents forcing their kids to switch to a one-hander because the player is a physically short baseline player and needs more reach. This seems crazy to me and shows skewed developmental priorities. Stocky baseline players generally choose a two-hander because it beefs up their returning and passing shot capabilities. Small stature players with one-handers can still be great players, but I generally prefer to see these players, if they have the right aptitude, learn a two-hander to help their return and passing shots. Does the one hander give a reach advantage on the run? So I applaud the acceptance of the two-hander in the tennis teaching and playing community—it is a great shot with many advantages; but, at the same time, I encourage players and coaches to experiment with the one-hander. It may take longer to develop, but for certain players it is more appropriate. As discussed above the one hander may have slightly more reach, 1-2 inches longer at contact, than the two-handed shot. This can give a player a small edge when stretched and on the run. The one-hander naturally leads to better motor development of the right arm, which helps coordination and strength on the volley and slice backhand. The single-handed player almost always has a better backhand volley and slice than a double-hander because he develops more coordination and strength in the right arm. The single-handed player, as a result, is sometimes more fluid when transitioning between slice and topspin drives, and is often more likely to use his slice stroke. One handers usually transition seamlessly from drive to slice. The one-hander generally also has better disguise of the slice, although this can be mitigated if the two-handed slice is taught with a disguised preparation. For me, the biggest reason to teach a one-hander is to develop a great backhand volley and a great half-volley. But I don’t consider this the foundational reason for me to decide to teach a one-hander over a two-hander. The most important determining factor is what is right for each individual kid based on his physical abilities, strength, coordination, and personal preference. I firmly believe that some players were born to be one-handers and some were born to be two-handers. Game styles and other theoretical discussion cannot override the basic physiological and psychological makeup of a player. The fact that a player will be an attacking player in the future, for me, is maybe a tiebreaker factor, and would help me decide to go with a one-hander over a two-hander only when a player showed aptitude for both. But the bottom line is that it is possible to develop a great all-court player with either stroke. I read the story of Pete Fischer changing Pete Sampras’ backhand at age 14, ostensibly so that he could win Wimbledon. Robert Lansdorp was brought in to teach Pete the one-hander but even he second guessed this decision years later because he felt Pete had a great two-hander. Rare footage of Pete Sampras’s two-hander from 1981. Early in his career Pete hit many flat winners with his one-hander, for example in his first Open win over Agassi. But later in his career when he began rolling more backhands crosscourt the shot became a vulnerability at times. Did the change improve Pete’s net and transition game? Since we can’t clone Pete and try the experiment both ways, there is no conclusive answer. Obviously it worked out well for Sampras, but for most players I would be wary of attempting a major change so late in the developmental cycle. I hope this introductory article makes clear that there isn’t a simple answer to the question of which shot is better or which one to teach, and that good coaches need the ability to develop either variation in the best interests of the player. In the next installment I will go into more detail on how I personally make this decision. After that we will outline the technical process for building a world class one-hander. Stay tuned. Chris Lewit is the director of the Chris Lewit Tennis Academy, with locations in the New York City area. He has coached numerous nationally and internationally ranked junior players, including several current top American players. 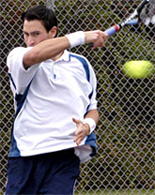 After playing #1 singles for Cornell University, Chris competed on the ITF and USTA pro satellite and futures tours. He is a member of both the USPTA and PTR, and a graduate of the USTA High Performance Coaching program. In addition, Chris has traveled internationally to study the game with some of the world's top coaches. This article was adapted from his book, The Tennis Technique Bible, one of several current publication projects. A leading expert on the traditional and progressive Spanish methods of training, Chris's new book Secrets of Spanish Tennis will be published in 2014 by New Chapter Press. Click Here to learn more about Chris's teaching system, his book projects, and his teaching academy.